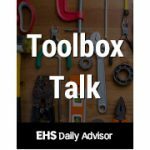 Get your safety training off on the right foot with free toolbox talks. Start training workers on three critical topics: fall protection, back safety, and head protection. Access now! Does Your PPE Program Meet Cal/OSHA Requirements? 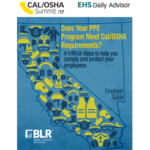 This report examines the three critical steps that Cal/OSHA requires in its general regulation on PPE, as well as the vital—but not mandated—fourth step of following up. You’ll also learn how these general rules apply to the various categories of PPE. Brief toolbox talks can be incorporated into busy schedules to relay new safety precautions or reinforce the safety message. 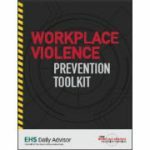 Download this toolbox talk to take a simple step towards championing safety at your facility/jobsite! 30% of employees injured at work have been on the job for less than a year. It seems like a high percentage, doesn’t it? Why is it so high? 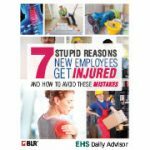 To answer that, let’s take a look at 7 stupid reasons new employees get injured. 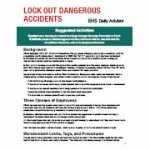 Use this lockout activity to prevent dangerous accidents. You’ll get suggested activities, a compliance refresher, and handy checklists. 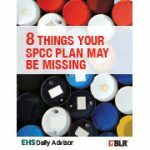 Developing and implementing your facility SPCC Plan is no small feat. There are numerous requirements for plan content and also additional requirements for carrying out monitoring, recordkeeping, and inspection protocols. To help you, we’ve outlined 8 common plan deficiencies in this free download. 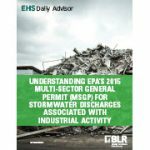 This Special Report will help guide the regulated community through EPA’s 2015 MSGP for stormwater discharges associated with industrial activity. The 2015 revisions have significant deviations from the previous 2008 MSGP that warrant the regulated community’s attention. This Special Report contains information on applicability, compliance deadlines, routine inspections and quarterly visual assessments as well as selecting and implementing control measures. 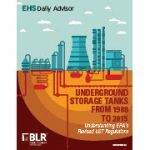 After 27 years, the U.S. Environmental Protection Agency (EPA) released new regulations for underground storage tanks (USTs). Expanding on the 1988 regulations, the new regulations aim to curb releases of petroleum and hazardous substances into the environment. The EPA estimates that 6,000 UST releases are discovered annually. To minimize these releases, the revisions focus directly on ensuring proper operation and maintenance of UST equipment as well as emphasizing the importance of operator training. Near misses are accidents waiting to happen. 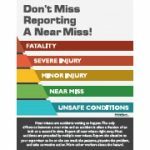 Download and print this free poster for your workplace to help reduce injuries and remind workers of the importance of reporting near misses.